Fin whales are found worldwide, typically migrating from the poles in summer, where they breed, to temperate waters for the winter. Often solitary, they may also travel in pairs or in small pods of 6 or 7 individuals. 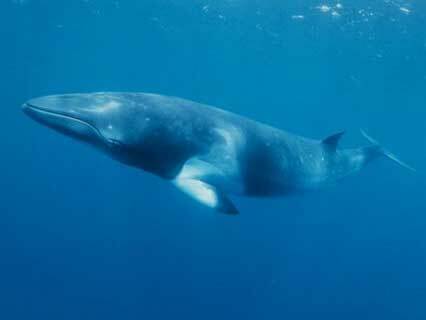 A distinguishing feature of Fin whales is the asymmetrical coloring of their left and right mandibles. The left is a bluish-grey color while the right is mostly white. The reason for this unusual patterning is unclear but may somehow aid in the capture of prey as Fin whales feed in a tilted position. The fastest of the baleen whales, Fin whales also dive deeper than many other whale species, they can spend up to half an hour underwater.They feed on a wide variety of marine organisms including squid, krill, and larger schooling fish such as cod and pollock They can consume up to two tons of food per day. During feeding, large volumes of water and food are taken into the mouth.